Before launching their weekly reality TV series, the Duggars starred in five Discovery Channel specials. The second, which aired in March 2006, featured the birth of Johannah Faith Duggar, number 16 in the family lineup. Today, Johannah is 10 years old. Happy birthday, Johannah! Happy Birthday to one of my favorite Duggars.....keep smilin' Johannah!! You should have put a picture of Johannah and Jackson together. They are such a sweet pair! Hey pretty girl, have a great birthday!!! Happy 10th Birthday Johannah! I can't believe you are 10 already. I hope your day is filled with lots of fun, laughter and good times with your family and friends. It aired in march 2006. She was born in October of 2005. Said the show aired her birth in March 2006 nit that she was born in 2006. The special aired in 2006. It was filmed months before and she was born on Oct. 11th, 2005. She was born in 2005. Episode I red in 2006. She is 10. She was born in 2005. Episode aired in 2006. She is 10. That is when the episode aired featuring her birth. The episode aired in 2006, she was born on 10-11-2005. It aired in 2006, but was recorded earlier. It aired in 2006, but was recorded previously. She was born in 2005. The special Aires in march of 2006, it was filmed in October 2005. Happy Birthday Sweet Johanna. I loved watching you and Jackson interact on 19 Kids and Counting. Wishing you all the blessings of the Lord as you grow in His Love and special plan for you. Pray for you all! Love, Sandy B.
Wishing you a day full of love,happiness and blessings. Wishing you a birthday filled with love,joy and FUN! Happy Birthday Johanna, you are a beautiful young girl! Have a wonderful year! Happy Birthday Johanna! Enjoy you special day! Wow 10 years old already Happy Birthday Johannah, [Hanny] ! 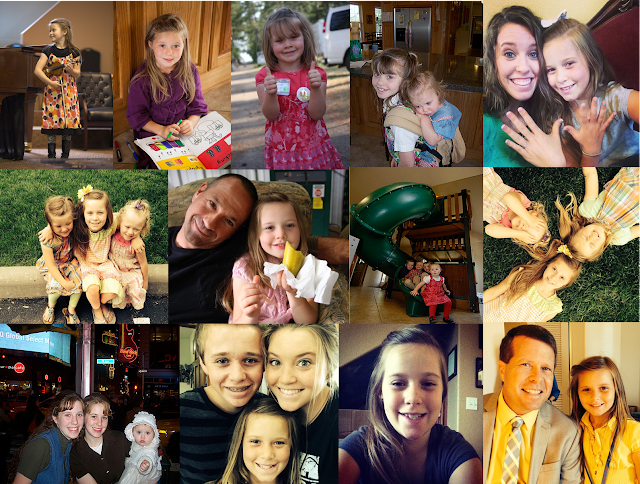 Blessings Duggar Family !!! Happy Birthday Johannah ! May the Good Lord Bless You ! @Anonymous She was born in 2005. The show featuring the birth was in 2006. Hope you have a great 10th birthday today. Congratulations all the way from Ecuador! Wow, I can't believe Johanna is in double digits already...growing up so fast! Happy 10th birthday, sweet Johanna. You are a very special girl with a great personality! I hope you've had a wonderful day! Happy Birthday Johannah !!!! I hope you have many more to come . @AnonymousAnonymous, the article said the episode was aired in March 2006, not that she was born in 2006. You are one beautiful little girl. I remb. you on Uncle Jims shoulders! I miss seeing you for sure. Happy Birthday sweetie. I love all the Duggar children but must admit Johanna and her mischievous sweet smile and cute answers when questioned has been one of my favorites! Happy Birthday Sweet Johanna! Happy Birthday Johannah, have a blessed day! Happy birthday to you and I pray that your day is awesome. I do miss seeing all the little ones... Happy Birthday Hanny...You look so cute in your hat. Have a great birthday. Happy Birthday Johnanna hope your day was just wonderful hope you got everything on your wish list !! It said the episode aired on that date. Not that she was born on that date. Obviously it wasn't a live episode. Have a great Double Digit birthday, Johannh! You are a precious girl and God has a special plan for your life!! I can't believe she is 10! She was always one of the little girls. Guess they aren't that little anymore. Happy Birthday Johannah Faith! May God bless you always. Happy Birthday Johanna ! You're a sweet young lady. Let Jesus smile through you! Happy birthday. What a lovely young lady you. Happy Birthday! Your getting to be such a big and a very beautiful girl. God Bless. Happy Birthday Johannah Duggar and Go Bless you many more too come. Happy birthday Johanna I hope you had a fun filled day have wonderful year! Happy birthday Johanna! Wishing you many more birthdays. You are truly blessed and loved by all! HAPPY BIRTHDAY HANNIE!!! I watched this beautiful young lady being born then growing up, her and Jacksons sweet relationship and funny antics i will remember with lots of laughs and smiles.I am really going to miss watching them grow.We see photos now and again, but not seeing them in my livingroom or hearing their voices makes me very nostalgic. I pray we get them back someday someway, i still feel like i lost my best buddies. Happy birthday Johanna!! You are such a sweet girl and I wish you a life full of blessings and happiness!! Sooo beautiful:) She looks so much like a Duggar! They're a really gorgeous family! May God bless you and your [big:)] family in the coming year! Love y'all!!! Hope you had a nice birthday full of your wishes coming true. You have grown into such a sweet and lovely young lady. Happy Beleted 10th Birthday Johannah ! Hope you had. A good day. We'd like to see Janna and Ginger. I find it rather odd that someone would be so snarky about how old JoHannah is!! Obviously her family knows when she was born!!! Sigh. people just need to calm down and stop making large issues out of small things. @Anonymoushappy Birthday Hannie, so grown up and pretty. Enjoy Honey. Happy Birthday Johannah, miss seeing you and Jackson together. Hope you've had a great day Honey. Happy birthday Johannah! May our Lord bless you richly in all you do. Where is a picture with her mother?? Really miss seeing her cute interactions with Jackson. I was sad to see the show go off the air. The morals and principles you taught your family are admirable. But I understand that God also gave us free will, so anything that goes against what you taught is of the devil's doing. Happy birthday Johanna!!! To all of your children and grandchildren----you are each on of God's miracles!! !